Delight everyone in your home or the home of a friend or loved one with this colorful favorite. Featuring the signature hues of the holidays, this decorated Christmas wreath features a fancy gold-lined red ribbon contrasted against rich aromatic evergreens. 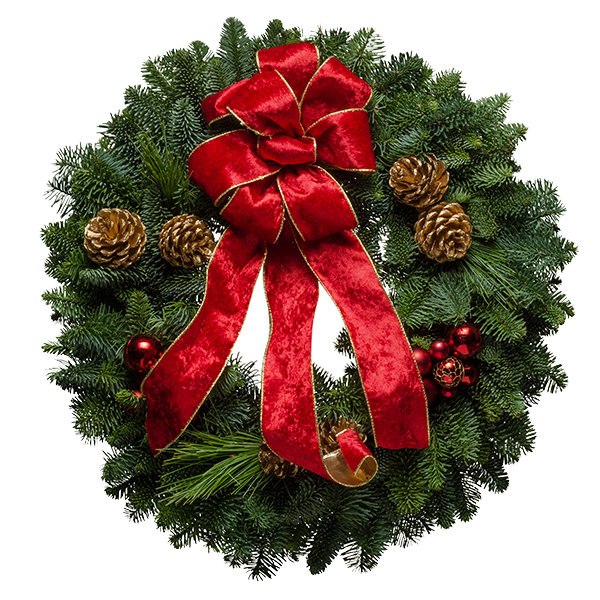 This will surely be a wreath that is cherished throughout the season. Ready to ship anywhere! "Oh My Heavens! My wreath just arrived. Now my home in Ohio smells just like Christmas should and did smell when I lived in Washington. I love your wreaths and I'm ever so glad my Dad sends us one each year. Thank you for such a fragrant wreath! It makes me not so homesick this time of year. WELL DONE.!"